The Knights of Columbus is the world’s largest fraternal service organization. Here at St. Anne, we are the Divine Mercy-St.Anne Council 16022. We were chartered on July 26, 2014. We meet on the 4th Wednesday of the Month at 7 p.m. in the multi-purpose room. Some of the events that we have been involved in include: Divine Mercy Adoration Area, various Knights of Columbus drives such as the Tootsie Roll Drive, Lifesavers Drive, the Punt,Pass & Kick, and Coats for Kids. We’ve also have Columbus Day Benefit, Sunday Breakfast Fundraiser, Packer Tailgate, Restaurant Benefit Nights, just to name a few. We also assist in the Mass as Acolytes and Eucharistic Ministers, as well as the Scrip Ministry. If you’d like to join in assisting parish life here at St.Anne and need a night out come see what the Knights are all about. 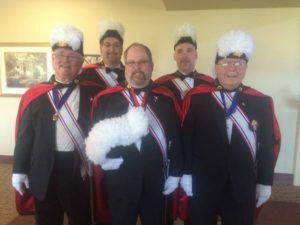 To obtain more information about the Knights of Columbus, or to register please go to www.kofc.org/joinus. Contact Rich Mich at shercookr@yahoo.com for any further questions.